In the center of Le Creusot what was once the world's largest steam hammer stands as a memorial to the area's industrial past. Unlike the rest of Burgundy, this area succumbed to the industrial revolution when large deposits of coal were discovered. The mining gave birth to a thriving heavy metals industry. Today much of that activity has faded into history. The last mine was closed in 2001. However iron work has survived mainly through the world famous red and black cooking pots and pans from the ‘Le Creusot' company. 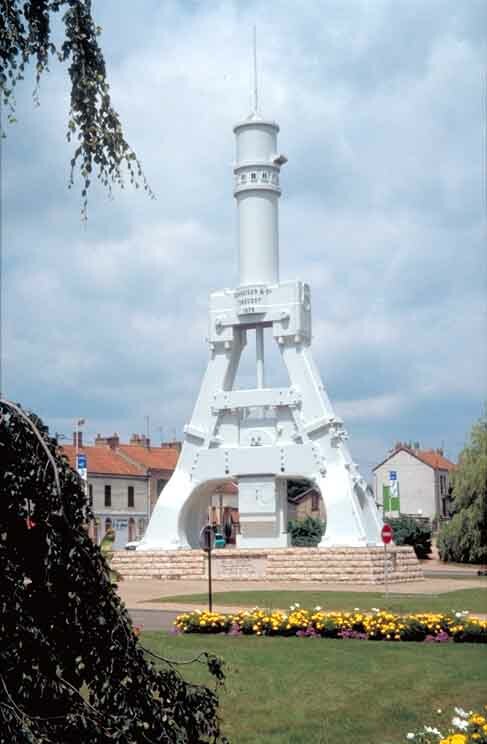 Once the largest steam hammer in the world, it is now a monument in Le Creusot. The steam hammer quietly standing sentinel over the town is an apt symbol for today. For whoever wants to win this Tour is going to have to really ‘put the hammer down'. 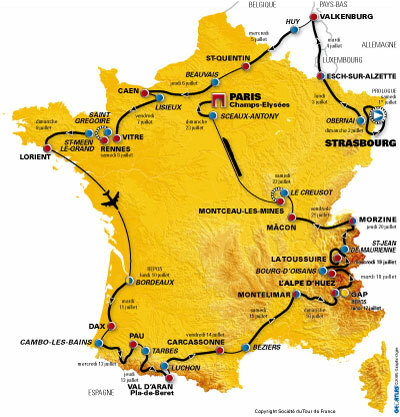 The course is difficult with narrow winding roads and climbs up and down the valley. All three major contenders (Pereiro, Sastre and Landis) will appreciate the climbing and consequently the contest should be extremely close. Carlos Sastre is 12 seconds behind race leader Pereiro. Landis is 30 seconds behind Pereiro. Whoever rides fastest out of these three will likely win the Tour. Fourth placed Kloden is 2:29 back and, based on past performance in this Tour, will not be able to leapfrog the other three. The same goes for Evans (at 3:08), Menchov (at 4:14), Dessel (at 4:24) and Moreau (at 5:45). All of these riders will be riding flat out either to earn their place on the podium or to inch themselves higher up in the GC table. Serguei Gonchar, the winner of the last long TT and former holder of the Yellow Jersey in this Tour, blitzed the course mashing huge gears. His 1hr 7:45mins was over three minutes better than the best time set to that point. However Gonchar started the day in 57 th position on GC nearly two hours back. For the leading contenders Gonchar's time would be an important benchmark. Second only to the Yellow Jersey battle was that for the young rider White Jersey. Marcus Fothen (Gerolsteiner) left the start house just three minutes before Damiano Cunego (Lampre) who has just a five second advantage over Fothen. As potential future Tour winners, their TT's were both against each other as well targeting a high place on GC. Cunego was on an inspired ride. At the second time check he was third fastest rider. Behind him the big three had left the start house each looking very tense and nervous. At the first check Landis posted the fastest time of the day. More importantly he had now passed Sastre on GC (who was 14th, 1:05 down) and closed within 21 seconds of Pereiro. Landis, ‘the Phoenix ' was on fire. At about the time Cunego finished and comfortably beat Fothen for the White Jersey, Landis was hammering away and forging his Tour victory. He was now virtual race leader by five seconds but Pereiro was putting up an incredible fight. Through the 34km time check Gonchar was fastest and Landis was second at 26 seconds. Pereiro was 57secs slower than Landis and Sastre was now well out of Yellow Jersey contention. In this Tour of surprises Andreas Kloden (T-Mobile) was pulling out one of his own. Doing a brilliant ride just seconds slower than Landis he was rapidly overhauling Sastre. At his rate of progress he was heading for a place on the final podium. Sure enough at the third time check at 51.5km he was second fastest and 22 seconds faster than Landis. Pereiro was 1:30 minutes slower than Landis and his potential Tour win was evaporating fast. Rubbing salt into the wound was the fact that he was also in danger of losing 2 nd place on GC to Kloden. Gonchar won the day by 41 seconds from Kloden. Landis was second at 1:11 minutes and Pereiro at 2:40 minutes. Floyd was back in Yellow by 59 seconds from Pereiro and Kloden was now 3rd at 1:29. Poor Sastre slipped to 4 th on GC at a distant 3:13. Of worthy mention for believers in eternal youth was Viatscheslav Ekimov who at 40 years of age, and the oldest rider in the Tour, rode into 7 th place today just a few seconds behind the youthful Zabriskie. Absolutely amazing! Landis and Pereiro put up a tremendous fight. With the team managers using TV, radio and direct communications, a modern Tour TT is as much a psychological and high-tech battle as it is an athletic one. Pereiro starting after Landis had the upper hand as he knew exactly where he was in relation to Landis. His time targets were predefined by his adversary. Landis on the other hand had probably intimidated Pereiro with his display of sheer power and aggression on the road to Morzine two days earlier. Neither of them was too concerned with any other rider as their respective team managers maximized their use of technology to drive their riders on. Gonchar may have put the hammer down to greatest effect today but it was Landis who forged Tour victory with another magnificent flight of the Phoenix ! All he needs do now is stay upright and out of trouble on the final stage to Paris where, for the eighth consecutive year, an American will stand on the top step of the podium. Tomorrow: Paris at last! 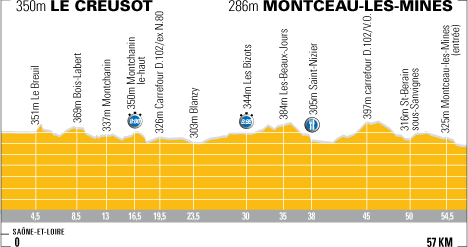 Starting in Sceaux Anthony, the 152km stage will probably be a promenade until it reaches the finishing circuits in Paris . Check back with CyclingRevealed for the “Final Impression”.